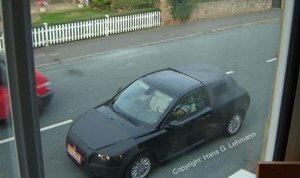 A lucky amateur spy in a small village in England managed to shoot the very first pictures showing two prototypes of the upcoming Volvo C30. The mysterious cars drove by just once and disappeared. 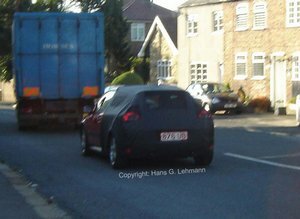 The C30 is a new model the size of the VW Golf, and is to be built on Ford’s C1 global small-car platform, which is also being used for the Ford Focus, Volvo S40 sedan and V50 wagon, and Mazda3. The C30 will be about eight inches shorter than the S40 sedan. It is a three-door hatchback coupe, and its styling is derived from Volvo’s Safety Concept Car, which itself is reminiscent of Volvo’s famous 1800 ES wagon. The C30’s power is said to come from a twin-cam four-cylinder engine, although Volvo is also looking for hybrid powertrains. The C30 will become a competitor against cars like the Audi A3, BMW 1-Series, and the Golf. The new model will appear at the Paris auto show in the fall of 2006; production should begin late next summer at Ford’s plant in Ghent, Belgium.